Even if I did not already have the country of Morocco on my “wannago” list, reading Mint Tea and Minarets would certainly have put it there in a mint-scented heartbeat. And when is the last time you picked up a “cookbook” and did not put it down until you had read through to the last page–breathlessly following a story? With a supporting cast of delectable dishes, the star of Mint Tea and Minarets is Dar Zitoun, beautifully restored 16th century mansion known as “House of the Pasha” in the city of Azemmour. Kitty Morse’s father, a British diplomat in Morocco soon after the country declared independence from France, bought and refurbished this grand riad. 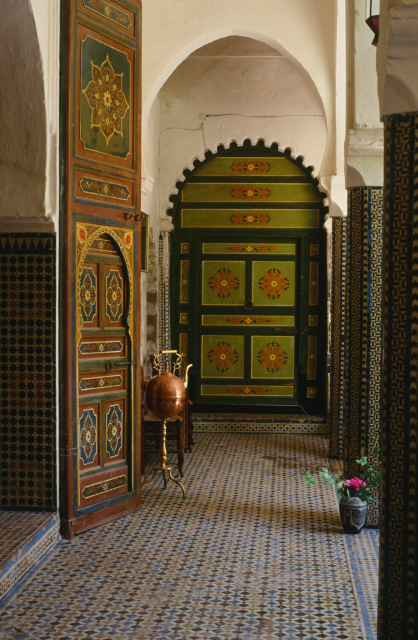 It is now all the fashion to find a riad — or rooms in a riad— to occupy when one visits Morocco, but Kitty Morse had the advantage of having a riad in the family and Morocco as a home. After she left for the United States, she kept returning to Morocco and made her life’s work lecturing and writing about Moroccan food. 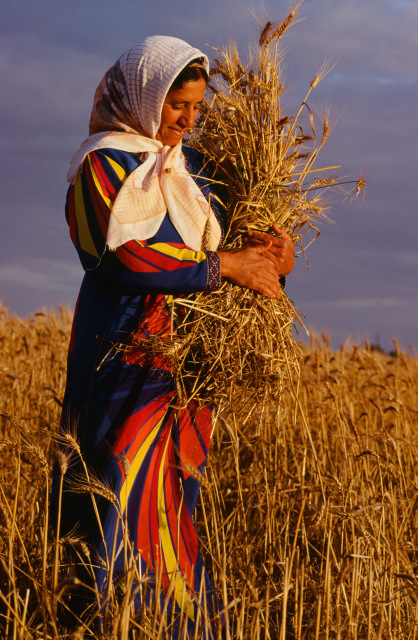 For many years she also led culinary tours to Morocco. The author’s background guarantees a food book that will be delicious, accurate and informative. The recipes that end each chapter are exotic but not beyond the reach of an American cook. 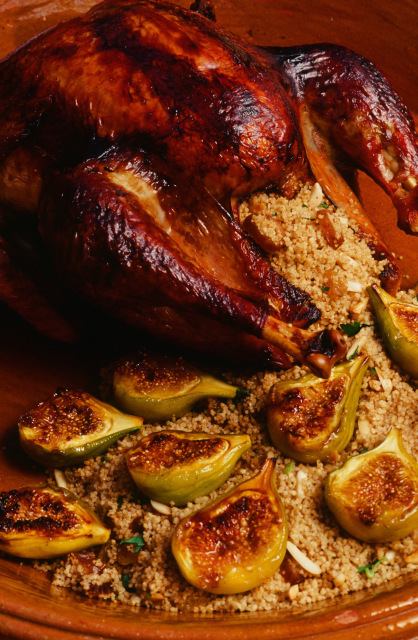 For instance, you can turn your Thanksgiving turkey into a Moroccan treat with the recipe for Turkey with Couscous and Figs. Although Morse has written several successful cookbooks about Moroccan cuisine, it is important to understand that Mint Tea and Minarets is much more than just a recipe book. Morse tells a riveting story that sweeps the reader into the emotional turmoil following Morse’s father’s death and decisions on what will become of the beloved house. As she describes her struggles with the Dickensian legal system of Morocco, we learn about Moroccan culture. While you are learning about the frustrations of the legal system, Morse also introduces you to smen (aged butter) and preserved lemons as she presents recipes for a variety of couscous and tagines. And she takes you on tours of the marketplace and out into the country to see the source of the foods that go into the dishes. 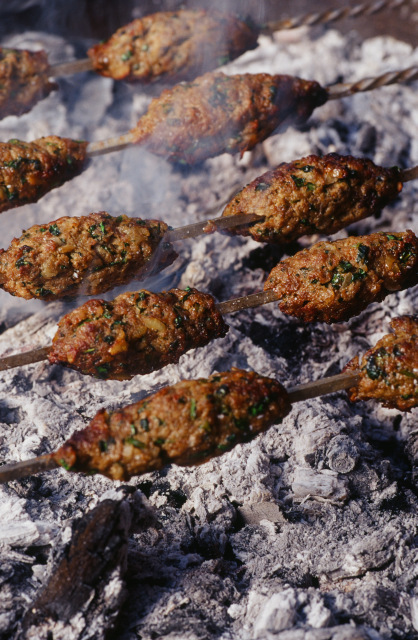 The recipes are mostly dishes made by the house’s caretaker and excellent cook–Azanour. The food photography (by Kitty Morse’s husband) made me salivate and start making shopping lists so I could created some Roast chicken with preserved lemons and braised vegetables or an egg tagine with olives or kefta, a dish similar to the Greek meatballs that I sometimes make. My only complaints about the book involve production, a common complaint with self-published books. The paper used, while providing a good framework for the beautiful photography, is heavy, making the book stiff and awkward yo hold. The Table of Contents lists the topic of the chapter’s narrative and the recipe contained therein, but does not say on what page the chapter begins. There is no separate list of recipes, which is particularly annoying because there is no index. So if you want to find a particular recipe it is a bit of a hunt. On the plus side, a glossary helps smooth out any difficulties you have understanding Moroccan words used. As I have said, the photography is outstanding. Most importantly, the writing is graceful and enticing. Whether you are interested in Moroccan food, or a non-cook interested in learning more about the culture of Morocco, Mint Tea and Minarets will be a definite asset in your travel library. Note: I do not usually accept self-published books, but in this case, the author had several other successful books published, so I took a chance, and I’m glad I did. All of the photos you see here were taken by Kitty Morse’s husband Owen and appear in the book. The book cover is linked to Amazon so that you can easily shop. I am an affiliate of Amazon, so when you use the link to buy something, I earn a couple of pennies. Thanks for your support.